According to statistics, we spend around 90 minutes a day driving. I think we can all admit that that’s a lot of time and we want to spend it in comfort. To make your car journey more pleasant, you can use some simple tips that will help you forget about inconvenient situations, like traffic. 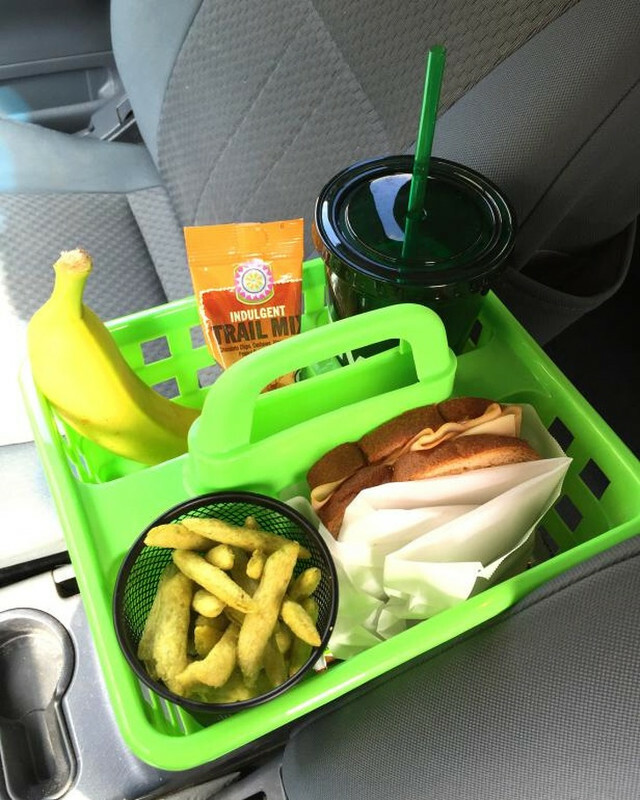 If you travel by car alone and want to have a snack without stopping, take a basket like this with you. It won’t disturb you and it’ll be easier to grab food and beverages. 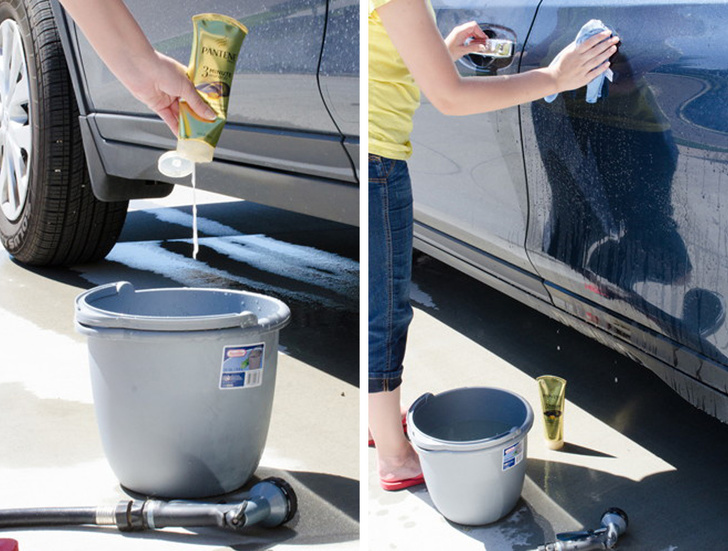 It could also help you keep your car clean. To free up some space in the back of your car, use a couple of snap hooks. Now all umbrellas, bags, and pouches won’t take up too much space. During long journeys, kids don’t know how to entertain themselves and get bored. 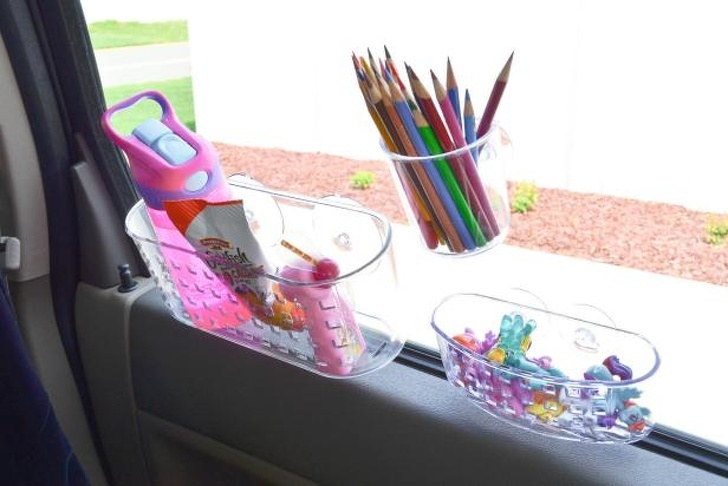 To turn your trips into adventures, use a couple of suction cup shelves that are typically used in the bathroom. Children can put their pencils and small toys in them. Your change is always with you. Sometimes we have to find change really quickly to pay at the drive-thru or to pay a toll. 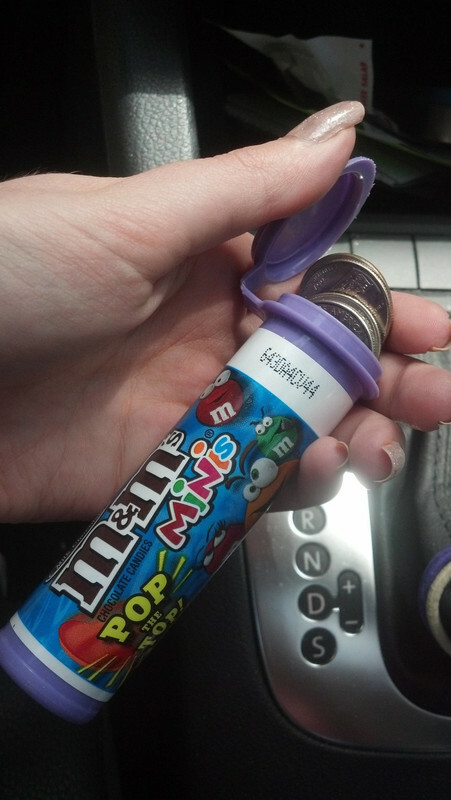 To avoid situations where you’re scouring the car for quarters and pennies at the last minute, store your coins in a candy container and keep it within arms reach. 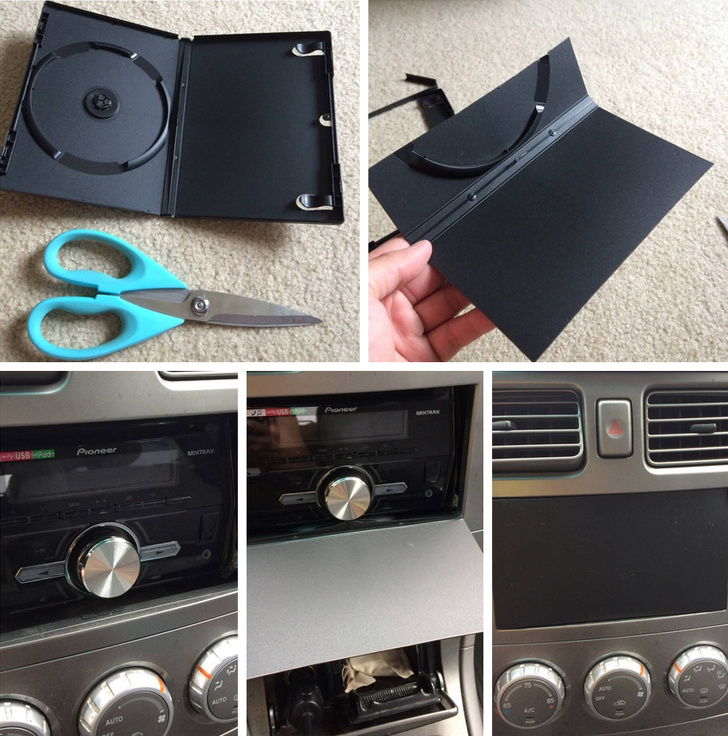 You can use a DVD holder to hide your stereo system while you’re not in a car. Thieves will think that you don’t have a stereo system and won’t try to break in to your car. 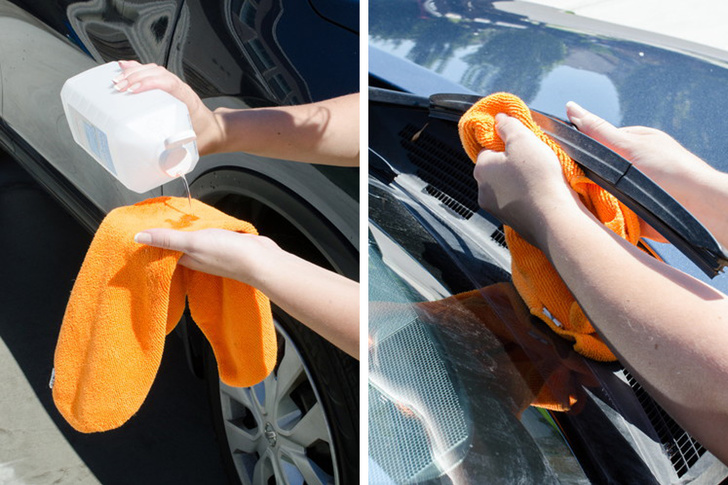 Add some hair conditioner to water before washing your car. Most conditioners contain lanolin, a kind of wax that will make your car shine. 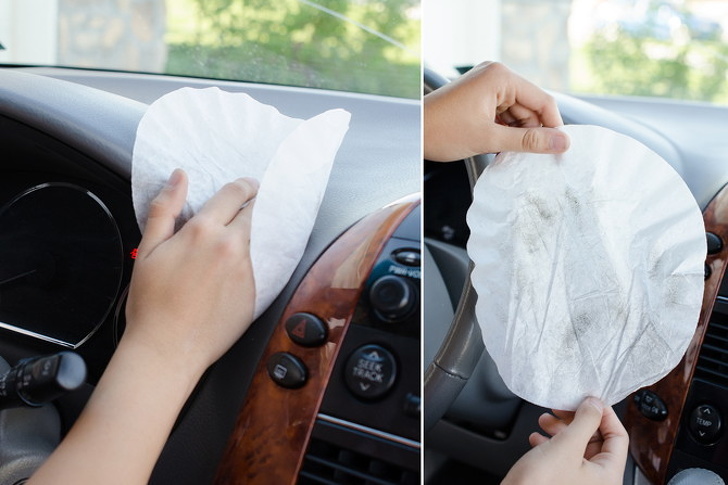 A coffee filter is the perfect dust cloth that will help you keep your car clean inside. These filters are made of lint-free fabrics that collect dust and leave no marks. To make windshield wiper blades work better, rub them with rubbing alcohol. Their surface will be degreased and the blades will be able to clear even the smallest rain drops. 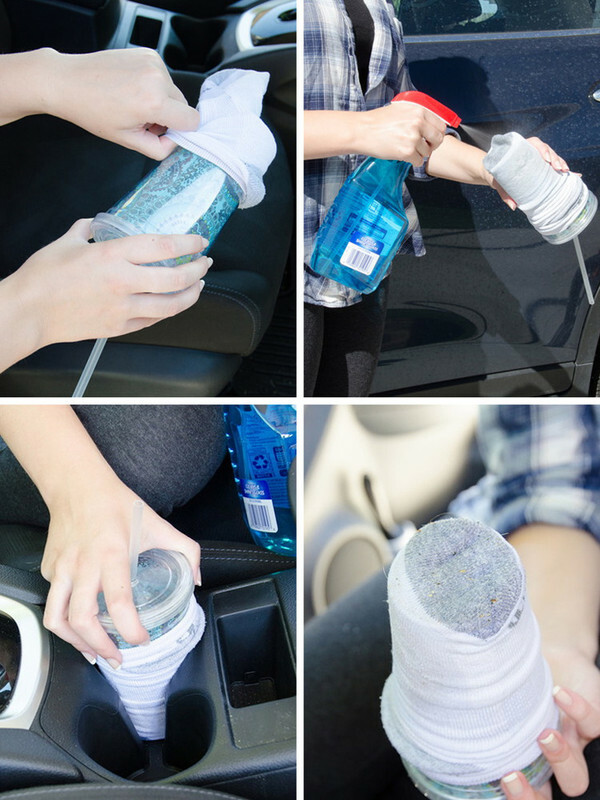 To clean cup holders, use a cup and an old sock, as shown in the picture. To make the process even easier, spray some glass cleaner on the sock. Here’s one more tip that can turn a long journey with kids into a pleasure. 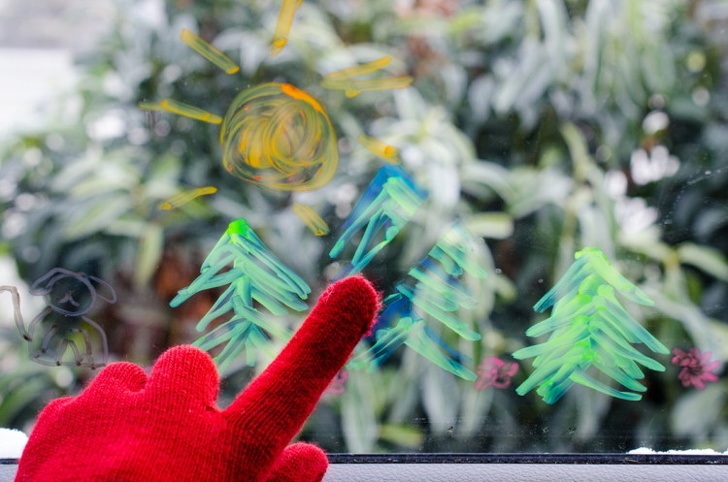 Let the children draw on the windows with dry- or wet-erase markers. You’ll be able to erase your kids’ masterpieces with an old rag. When you get in your car on Monday morning and see such a bright dashboard, we’ll bet you can’t stop smiling — happiness is in the little things. To create this, you need to place some colored duct tape on the inside to make boring light bulbs shine with your favorite colors. There’s a button on your car’s dashboard that really takes care of the air you breathe. It’s called the car’s recirculation button. Not a lot of people know exactly what it’s for, even if they do push it from time to time. If you are stopped in traffic, you can push this button to keep the dirty and polluted air from getting inside your car. It’ll recirculate the kind-of-clean air that’s already inside your car. 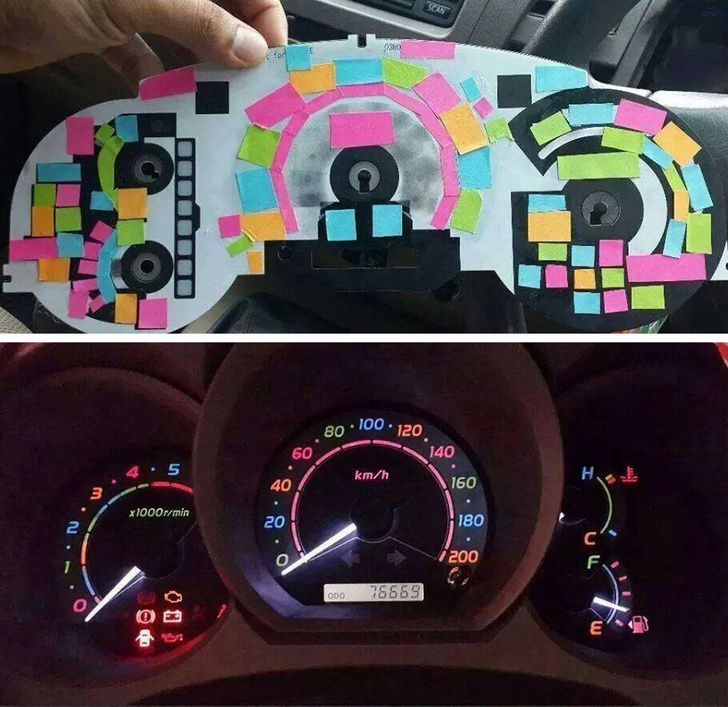 Do you have any other car hacks to share with us?